Rev. Jeremiah A. Wright is a Marxist and is the former pastor of the Trinity United Church of Christ in Chicago. In 1983, Jeremiah Wright served on the Harold Washington Campaign Steering Committee. June 22-28 1984, at the Methodist Church 23rd and K Streets a "Theological Seminar: Dr. Martin Luther King, Jr. in Memoriam" was held the Valedo District of Havana, Cuba. Granma, the Cuban Communist Party newspaper reported that the organizers were the Ecumenical Council of Cuba, the Baptist Worker-Student Coordination of Cuba, and the Caribbean Council of Churches. The Black Theology Project was listed as a US sponsor, and the Soviet controlled Christian Peace Conference was also represented. The appearance of US Presidential candidate Jesse Jackson, with Cuban president Fidel Castro, "was the highlight of a King memorial service attended by some 300 representatives of US, Caribbean and Cuban churches. Jackson was introduced by Benjamin Chavis. Other attendees included George C.L. Cummings, instructor in Theology of the Chicago Theological Seminary, Rev. Jeremiah Wright, pastor UCC Trinity Church Chicago, Tyrone Fitts, National Council of Churches Racial Justice program, Thelma C. Adair, executive director Church Women United, William Babley, director Racial Union Program Methodist Church, Esmerelda Brown Methodist Church, Calvin Bults Abyssinian Baptist Church, James Cone Union Theological Seminary, Howard Dodson chairman Black Theology Project, Jualynne Dodson dean Union Theological Seminary, Noel Eskind Emory University, Robert Franklin, professor of Ethics University of Chicago, Dwight Hopkins, vice chairman Black Theology Project, president Union Theological Seminary student association, Carolyn Knight, assistant pastor Canaan Baptist Church New York, Mark Ridley-Thomas, executive director Southern Christian Leadership Conference - West, Los Angeles, Gayraud Wilmore, dean Interdenominational Theological Seminary New York. As of May 11, 1992, Jeremiah Wright of the Trinity United Church of Christ had attended the founding meeting of Project Vote! Chicago Coalition, but had not been asked to fully commit until the next meeting. Faith as a Weapon: Spirituality and the Role of the Church In The Radical Movement. What are the lessons we can learn from Nat Turner, Absalom Jones, Sojourner Truth, Malcolm X, Martin Luther King, Jr. and other Black ministers as leaders in the struggle? What is the history of spiritual motivation in the radical/liberation movement? Panelists: Michael Eric Dyson, Cornel West, Rev. Jeremiah Wright, Linda Thomas, Kevin Tyson. Members of the advisory committee included Jeremiah Wright. 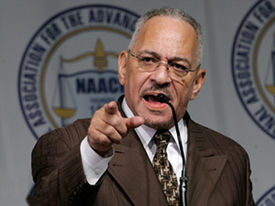 On April 18 2009 the Chicago branch of National Alliance Against Racist and Political Repression, a front first for the Communist Party USA, latterly for the Committees of Correspondence for Democracy and Socialism, awarded former Reverend Jeremiah Wright its highest honour. According to a report from the Communist Party USA's People's Weekly World. Human Rights awards were granted to honorees at the event whose work includes ending the death penalty, overturning wrongful convictions, the fight against racism and efforts to help victims of the prison industrial complex. Patricia Hill, executive director of the African American Police League; Jane Raley, senior staff attorney with the Northwestern Law School; Judith Stuart, an anti-prison activist, Rev. Jeremiah Wright, retired Pastor with the Trinity United Church of Christ; and Karen Yarbrough, Illinois state representative. Dr. Barbara Ransby, a professor in the African American Studies Department at the University of Illinois at Chicago, emceed the award ceremony. 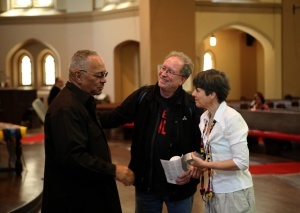 On May 18, 2009, Jeremiah Wright and Bill Ayers addressed a crowd of more than 400 at the First United Church of Oak Park during a forum before an annual walk calling for a just solution to the Israeli-Palestinian conflict. During his speech, Ayers poked fun at his "terrorist" label that of a "fiery preacher" given to Wright. The rally was organized by the Committee for a Just Peace in Israel and Palestine. On September 17, 2009, U.S. socialist magazine Monthly Review celebrated its 60th anniversary at the New York Society for Ethical Culture in New York City. Five-hundred enthusiastic supporters gathered to hear remarks by Robert McChesney, Grace Lee Boggs, John Bellamy Foster, Fred Magdoff, Rev. Jeremiah Wright, Michael Tigar and hear music by Toshi Reagon. 2011 marked the 20th Annual Malcolm X Commemorative Banquet, which was be held on February 19th, 2011 at 7:00 pm at the Association of Black Cardiologists Conference Center, located at 5355 Hunter Road in Atlanta, Georgia. World-renowned theological scholar and pastor, Rev. Dr. Jeremiah A. Wright, Jr. was the keynote speaker for the event. This page was last modified on 11 March 2018, at 07:28.